The Empty Bowls Project began about 30 years ago as a local fundraiser in Michigan. Since then, Empty Bowls has grown into an international, grassroots effort to combat hunger and food insecurity, with thousands of events hosted each year. Despite improved economic and employment conditions, thousands of people in Warren County still find it difficult to put food on their tables. The majority are working poor who are trying to support families on minimum-wage jobs. A growing number - about 20 to 25 percent - are senior citizens on fixed incomes. Since our first Mason Empty Bowls event in 2015, we have raised and distributed more than $43,000 to help fight food insecurity among Warren County residents. We want to thank everyone who participated in Mason Empty Bowls 2019 and helped us raise enough funds to benefit eight food pantries that help feed a combined 8,200 people each month throughout Warren County. Learn more about the pantries and their clients. In exchange for a cash donation (in this case, the price of your ticket), you receive a simple lunch of soup, bread, dessert and beverage and your choice of a handcrafted bowl. By being a part of Mason Empty Bowls, you also will be helping in the fight to alleviate food insecurity among residents of Warren County. Bring your online payment receipt or ticket to the Mason Grange Hall during your scheduled seating time and choose your favorite bowl from the hundreds that local potters, artisans and students have created and donated. Then you will head downstairs to the Grange Hall dining room, where you can decide which of the many soups prepared and donated by area chefs you want to try. Complete your meal with some bread, a dessert and a beverage. The handcrafted bowl is yours to take home to remind you of all the empty bowls that need to be filled. The 2018 event also features a Silent Auction of items donated by area businesses and artists and a "Buy It Now" table, where guests can find some great values in handmade pottery. Unless otherwise marked, all bowls are food and oven safe. Please feel free to ask one of our bowl attendants if you have questions. 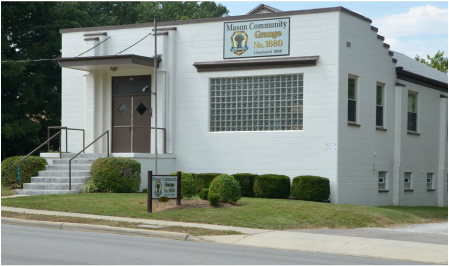 Mason Community Grange No. 1680 has been supporting area farmers and communities since 1908. It is Warren County's only remaining chapter of The National Grange of the Order of Patrons of Husbandry, which is the oldest farm advocacy group in the United States. The modern Grange is open to anyone who supports agriculture and believes in working together to make our communities better places in which to live. That's why it seemed natural for Grange members to host an event that helps put food on the tables of local residents who otherwise would go without. Mason Grange members reside in communities throughout Warren County, meeting the second Wednesday of every month at the Grange Hall in Mason. Mason Empty Bowls is one of several local and state community service projects that Mason Grange members actively support each year. Interested in becoming a member? Contact the Mason Grange using the form on our Contact page. Free parking is available in the parking lot across the street from the Mason Grange Hall. The Grange driveway and parking lot will be available to drop off guests whose mobility is limited. Please note: the Grange Hall has a stair lift, but it is not wheelchair accessible.